Make the most of in-season produce to make this slightly sweet apple cider vinaigrette made with apple cider vinegar and cinnamon. It’s September, which means two things – school is back in session and apples are back in season. Which do you prefer? I think I prefer the apples. I’ve become obsessed with homemade salad dressings over recent years. This Apple Cider Vinaigrette will be the ninth salad dressing I’ve posted – can you believe it, I have so many healthy salad dressings on here to choose from. Do you like salad dressings too? I hope so. I find that September is a bit of a weird month when it comes to food. We’re not quite ready for the comfort food of winter, but we’re craving more than light salads and have definitely hit our burger quota for the year. I find that if I can add a little bit of autumn to my salad, then it’s the perfect meal for the warm afternoons of September. This can be done in a couple of ways, either my adding in-season fall ingredients like apples and pears or through a fall-inspired dressing like this apple cider vinaigrette. This salad dressing is a great way to use up the remaining apple cider vinegar (it was perfect for barbecue sauces back in July). The secret ingredient I added to this homemade dressing to give it a touch of fall flavour is from the addition of cinnamon. 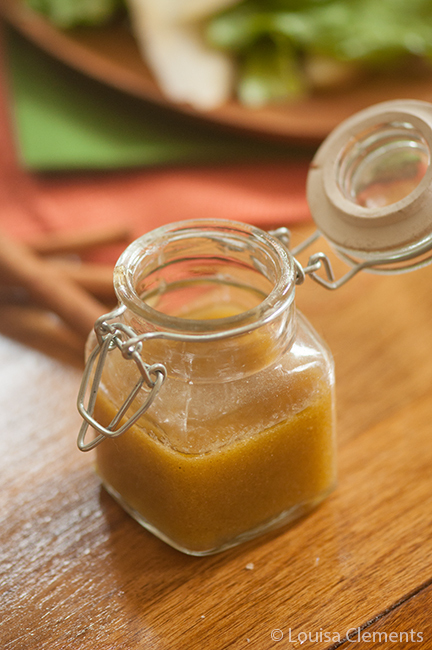 Cinnamon is a warm spice that adds a delicious and unexpected sweetness to this dressing. When I’m not in the mood for a salad (I like to make one with sliced apples and toasted walnuts), I actually love to dip apple slices in this vinaigrette. Instead of the typical honey sweetener as I do in my balsamic vinaigrette and white balsamic vinaigrette, I’ve opted to use maple syrup to sweeten this dressing as I found that it goes with the cinnamon and apple flavours of this dressing. Another favourite ingredient to add to this salad is a touch of blue cheese, which pairs so wonderfully with apple, walnuts and the cinnamon of this vinaigrette. I like to make a big batch of this dressing and keep it in the fridge to enjoy all week. This fall salad dressing is the perfect way to transition from summer eats to fall eats without wasting leftover ingredients from summer favourites. In a small bowl, whisk together apple cider vinegar, maple syrup, Dijon mustard and cinnamon. In a steady stream, pour in olive oil while whisking. Continue to whisk until dressing begins to thicken. Serve in a salad with toasted walnuts and apple slices, or just over apple slices as a healthy snack. 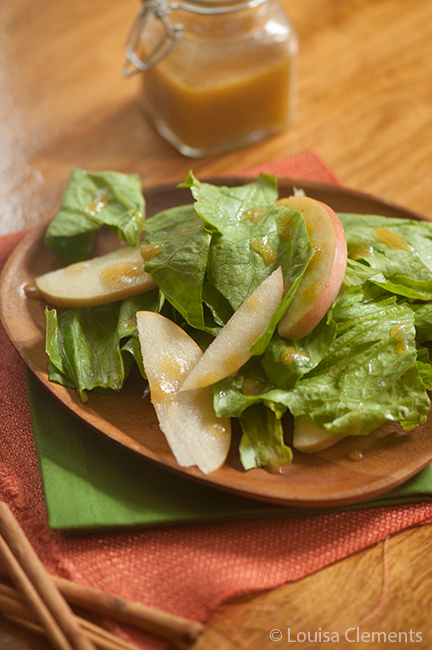 Enjoy this apple cider vinaigrette and let me know if you give it a try in the comments below. Your post makes me think of autumn already... and I love apple cider! I've never thought about using it as a dressing, and I love salad dressings from shallot-lemon to tahini-based creamy ones. What a fabulous idea for using cinnamon, this is a perfect dressing for sweeter salads filled with spices! It makes a great dressing! I've yet to try a tahini based creamy dressing but it's on my list! Sweet salads are the only kind I really like, so this dressing is perfect! I have all of the ingredients except the apple cider vinegar, but I've been meaning to get some anyway because apparently it cures basically all diseases haha. Sweet salads are new to me, but I'm obsessed! It really adds a nice layer to the salad. Ohhh this dressing looks so good! I love apples and sometimes I feel like we skip over apple season and go straight to pumpkin but apples are so good! I never considered putting them in a salad dressing before! Thanks for sharing. Pumpkin definitely takes over but I'm making an effort to do lots with apples this season. They are so good at this time of year! Thanks Maureen! This dressing would work on all kinds of salads--I love to make one with lettuce, chickpeas, walnuts, cranberries and apples with a little goats cheese and green onion!